Earlier in January, YG Entertainment released news that 2NE1 would be coming back with an album plus their second world tour, all under the title AON (All or Nothing). 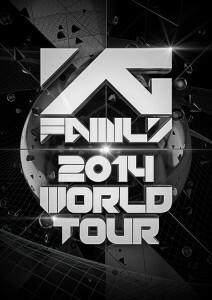 Adding onto that news, YGE has revealed they’ll be doing a YG Family – 2014 World Tour. Big Bang, 2NE1, Psy, Epik High, Lee Hi, and Winner are all set to perform at the concerts. Listed countries thus far are South Korea, Japan, and China with more to coming as the year progresses. To no one’s surprise, the first announced stops are in Japan: April 12 and 13 at Kyocera Dome Osaka and May 3 and 4 at the Tokyo Dome. The last time there was a YG Family World Tour, it was over two years ago and limited to South Korea and Japan. But even before that, in 2006 for YG’s 10th Anniversary, the company did a world tour, adding on three U.S. stops to two Japan ones and one in South Korea. But since the latest, the company lineup has changed drastically, with half of it composed for newer faces (to the company), allowing for a different dynamic. From just the lineup alone, the tour promises to be full of strong performances. From the inclusion of Winner, we can assume their projected February debut date has been solidified. But what I want to know is, what about Akdong Musician? While they don’t generate the same amount of buzz in the same demographics as their labelmates, they could bring a different flair to the concerts. Does the sound of a YG Family World Tour get you excited? Would you make time to attend the show if ends up coming your way? Here’s to hoping that their ‘world tour’ covers more than their last one!